The inability to understand facial expressions can have a profound effect on the lives of people with dementia and their families, says Dr Fiona Kumfor. Recently I met a lady who, despite only being in her 50s, was suspected of having dementia. Susan* and her family had come to the dementia clinic at NeuRA (where I conduct research) to get help with a diagnosis. Susan wasn’t forgetting things; in this sense, her mind was very sharp. But in the last year she had become far less socially engaged and caring, even towards her teenage children. For example, she had started telling private things about her children to people outside the family; she didn’t seem to recognise that it was embarrassing for her children. This was very distressing for her family, even though Susan herself felt that nothing was wrong. Dr Fiona Kumfor studies how dementia can disrupt a person’s ability to understand emotions. While this may not sound like the dementia you’re familiar with, the effects of this disease are in fact much broader than the confusion and memory problems of Alzheimer’s disease. People with the type of dementia we saw in Susan, called frontotemporal dementia, show profound changes in their behaviour and personality. One of the most difficult changes that families must cope with is a loss of empathy that occurs, at least in part, because of an inability to interpret facial expressions. For a healthy adult, interpreting facial expressions happens automatically and rapidly. Our research focuses on how this complex skill is affected in patients with frontotemporal dementia. Our research has revealed that people with this disease are unable to distinguish between facial expressions very well at all. Because they might mistake a sad expression for an angry one, they also have difficulty understanding how other people are feeling and responding appropriately. So what happens in the brain to cause this change? Importantly, our study has revealed for the first time that shrinkage in the frontal and temporal parts of the brain, in regions called the amygdala and insula in particular, is responsible for this loss of emotional understanding. Previous studies have shown that these regions activate in healthy people when they view emotional faces. The image on the left is an MRI scan of a person with frontotemporal dementia. The black areas show the frontal regions of the brain that have shrunk due to dementia. The scan on the right shows a healthy adult of the same age. This loss of emotional understanding undoubtedly makes interacting with others challenging; people with frontotemporal dementia are no longer able to understand the subtle social cues that healthy people take for granted. It can cause conflict if they misinterpret their friends and family’s emotional expressions. This was certainly the case for Susan; her family told us that she didn’t seem to understand when they were feeling upset or frustrated anymore. Unfortunately at present no cure exists for frontotemporal dementia. We do hope, however, that our findings will help in the development of techniques to improve the quality of life for people with this disease and their families. In fact, we’ve already had some heartening results. 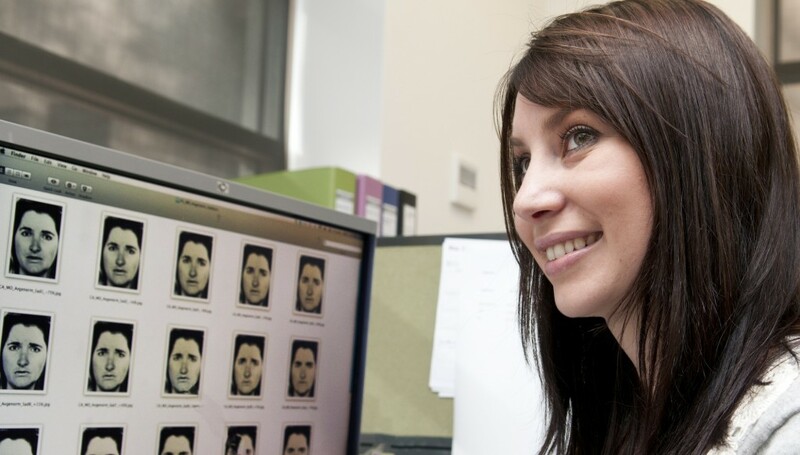 A second study we conducted showed that, in some cases, exaggerating the emotional expression improved how well patients recognised the emotion. For me, this finding is particularly encouraging because it suggests that even simple techniques may have a direct and positive impact on how people with frontotemporal dementia and their families can continue to communicate and connect.